Every reseller account comes with a free domain reseller account. You will be able to sell your customers domains, transfer domains, and even setup a whois form to run off your site allowing for real time whois checks to see if the domain is available. If you were open an Resell.biz account on your own they would charge you a $500 startup fee, and your rate for domains would starting at $8.50 a year. There are no strings attached. We give you one Resell.biz reseller account for free!! We will even let you keep it if you should decide to leave our hosting. You, and Your Entire Reseller tree can point your own URLs to the interfaces avail of Custom Branded Nameservers. Host4Cheap Domains directly provides a module which allows you to accept payments from your Customers, using any Payment Gateway. Point and Click Integration is available for popular Payment Gateways such as Pay Pal & many more. You, Your Resellers and Customers, their Resellers and Customers and so on infinitely, get completely brandable, multilingual Control Panels to manage all your/their Orders. This Control Panel allows you and your Reseller/Customer tree to Add Orders, Manage Orders, Make payments, Add funds etc. 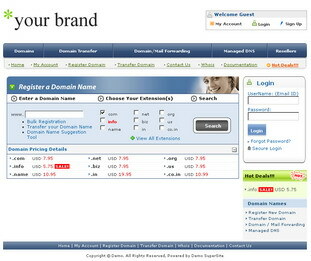 Host4Cheap Domains offers a comprehensive Storefront from where your Customers may place their Orders. The Storefront is completely customizable. You can modify the look and feel, point your own URL to it and modify the content of the same. Along with your Reseller account you get FREE API Integration. The API is available in PHP, Java, Perl and ASP. You have the freedom to create Customers and Sub-Resellers under you. Each Customer and Sub-Reseller under you will get their own branded Control Panel. This will allow your Sub-Resellers to enjoy all the facilities that you enjoy. Ours is the only Reseller Program that natively supports the creation of Infinite levels of Sub-Resellers. Also create sub-resellers so you can have your own domain resellers. The whole system has been designed to be as simple as possible; ANYONE can start their own business with the minimum of hassle. Once you have signed up from our site, you gain instant access to the control panel where you can setup your products, pricing margins, branding, billing and a whole lot more. After you have everything as you wish, you need to add credit to your account which will allow you to start selling products. Every time a customer buys a product from you (they pay you directly), or you purchase one yourself, the base cost is taken from your available balance - thus it's important to make sure this is always in credit otherwise you will not be able to sell any more products. Finally, choose a URL for your newly created shop site and start selling!